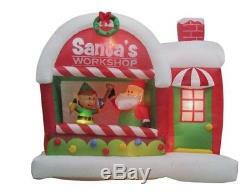 Inflatable Lighted Airblown Santa's Workshop Scene. Greet your guests in style with this Airblown Santa Workshop from Home Accents Holiday. Perfect as a yard decoration outside your home, this scene depicts Santa and his little helper as they prepare for the holiday season. The perfect way to greet guests and passerby, simply it in, stake it down and watch the magic unfold. Internal LED lights offer a beautiful nighttime display. Lights up with energy-efficient LEDs. Includes everything needed for setup. Inflatable Lighted Airblown Santa's Workshop Scene" is in sale since Friday, December 22, 2017. This item is in the category "Home & Garden\Holiday & Seasonal Décor\Christmas & Winter\Yard Décor". The seller is "rjdajd" and is located in Kittanning, Pennsylvania. This item can be shipped worldwide.